Q: In which book did a spider save a pig’s life? It’s Charlotte’s Web by E. B. White, of course, and that’s just one example of a question that might appear in the junior level of Durham Region’s Battle of the Books. The Battle of the Books is a fabulous partnership between public libraries and schools in Durham Region! Each year in April, the “Battle of the Books” teams from each school meet for the Semi-Battle competition. The top three teams from each division go on to the Final Battle to compete for gold, silver and bronze medals. The gold medal winners are awarded a trophy for their school and go on to compete in the Regional Championship. The Battle of the Books is hosted at two levels: the junior division is for students in grades 4 – 6 and the senior division is for students in grades 7 and 8. Contact the participating library in your community for more information: Clarington, Oshawa, Whitby, Pickering, Ajax and a northern division including Scugog and Uxbridge. Students: Have fun reading great books from a wide variety of authors and genres. 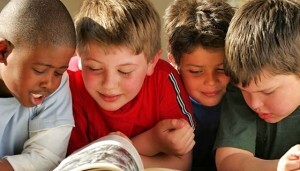 Educators: Encourage reading, foster friendly competition, and nurture the love of books in young people. Libraries: Encourage young people to read a wide variety of books and to engage with their local library. Click here to go to the Regional Battle of the Books website and find out more about how to get involved!